Are you ready for the next leg of our British DNA journey? Come along. We’re leaving Cambridge, visiting historic Coventry and arriving in the Ribble Valley, home of our Speak family ancestors, and the Pendle witches, today! Did I mention that we had some excitement in the hotel in Cambridge the night before we left? Aside from a very loud and roudy wedding party, the fire alarm went off about 1:30 in the morning. Jim leaped out of bed, shouting “what is that?”, grabbed his iPad, tore open the cover and frantically started pushing buttons to make the noise stop, thinking it was his alarm, of course. I started yelling at Jim that it was the fire alarm and to get dressed quickly. You can’t make someone with a hearing impairment hear over a fire alarm. So looking something like the keystone cops, we frantically threw clothes on and just as we were about finished and ready to evacuate, the alarm silenced, thankfully. Indeed, not before we were wide awake though. I wondered if the alarm had something to do with the wild wedding party. But justice was served. Because as we very sleepily boarded the bus the next morning at 8 AM, the alarm went off again, waking up all of those revelers:) I swear, I was ON the bus and had nothing to do with that. I have witnesses! Although I must admit, I did smile a very big smile. Ahhh, karmic justice! 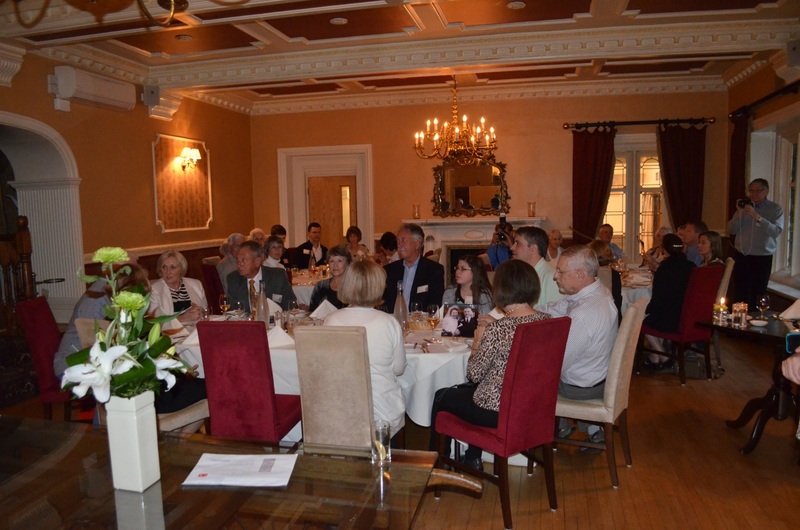 This trip was arranged in part by a travel agent, and in part by Susan Sills, the president of the Speaks Family Association, with probably too much help and input from members. The parts that Susan arranged were wonderful. The parts that the travel agent arranged were, at best, OK. I think they decided that we had 2 hours and were going past a landmark and we surely needed to stop at that location. I’m including some of these stops because they really did turn out to be historically interesting, but have omitted others. Were any of your ancestors skilled tradesmen? Tilers, bricklayers, stainers, painters, carpenters or merchants perhaps? If so, they were members of a guild, and guilds had guild halls. The men spent a lot of time in those halls. Have you ever wondered about that? What were they doing? What did the halls look like? Well, come with us today, we’re going to visit a pretty amazing one. Keep your ancestor in mind as we do, because their hall was probably similar to this one! 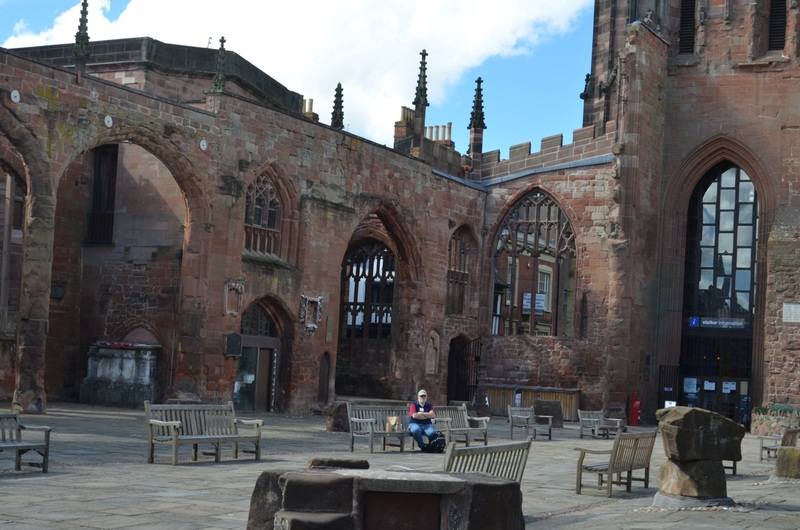 After leaving Cambridge, we arrived in Coventry, a city very heavily bombed during WW2. It was Churchill’s home town and had lots of manufacturing, so was a very attractive target to the Germans. 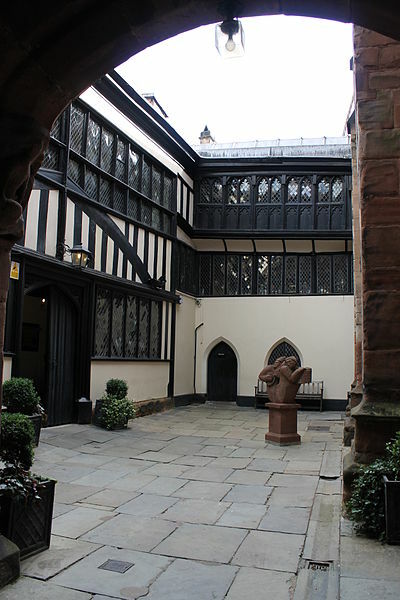 After arriving in Coventry, we met up with our walking guide and our first stop was the medieval St. Mary’s Guild Hall in quaint Bayley Lane. 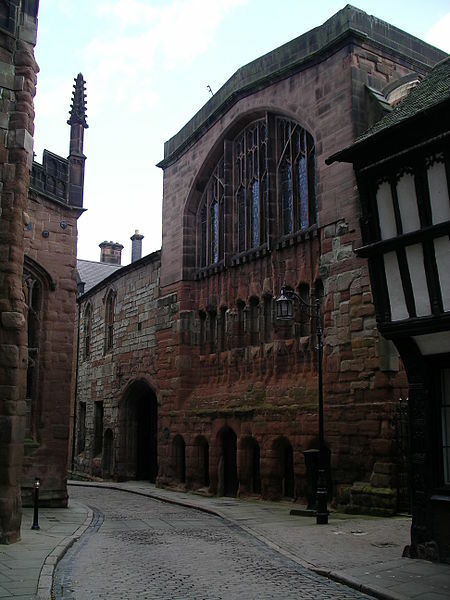 The Guild Hall is the tall building on the right with the archway entrances. 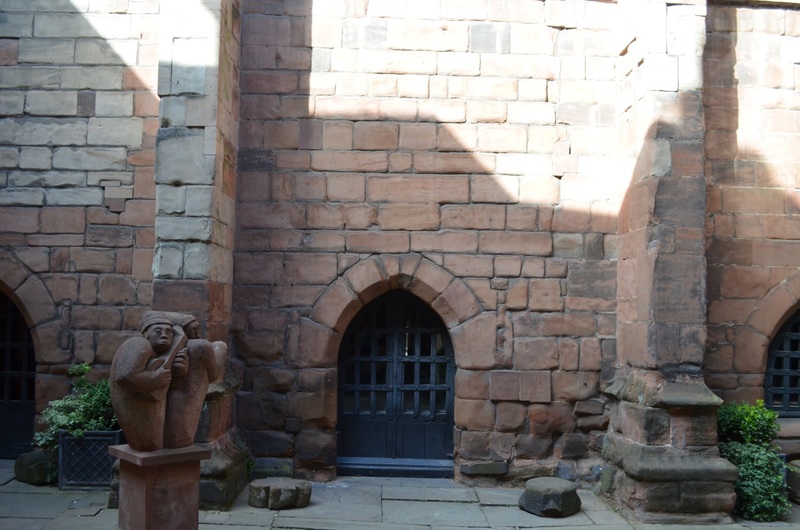 Built in the 1300s or so, it’s one of the city’s oldest buildings. It was the wealthy merchants guild, and also the town council chambers for a very long time. No undue influence there. 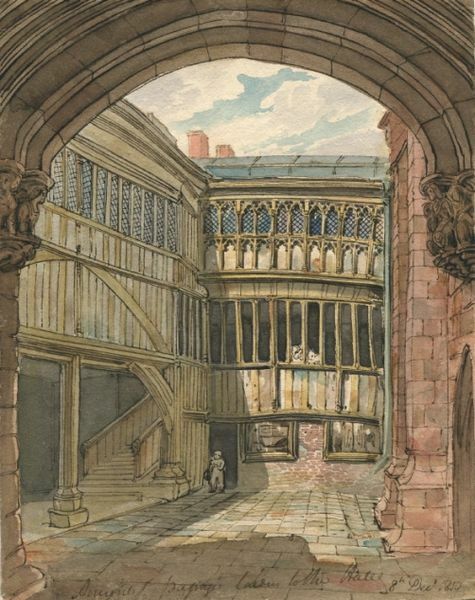 This 1810 painting is looking from the street through the archway into the courtyard of the Guild Hall. It doesn’t look much different today. One difference is that the staircase on the left is enclosed today. See the railing end in the photos below. It’s a beautiful buildings, nothing even or straight in the entire place. It was obviously not the carpenters guild. I love the old doors and archways. 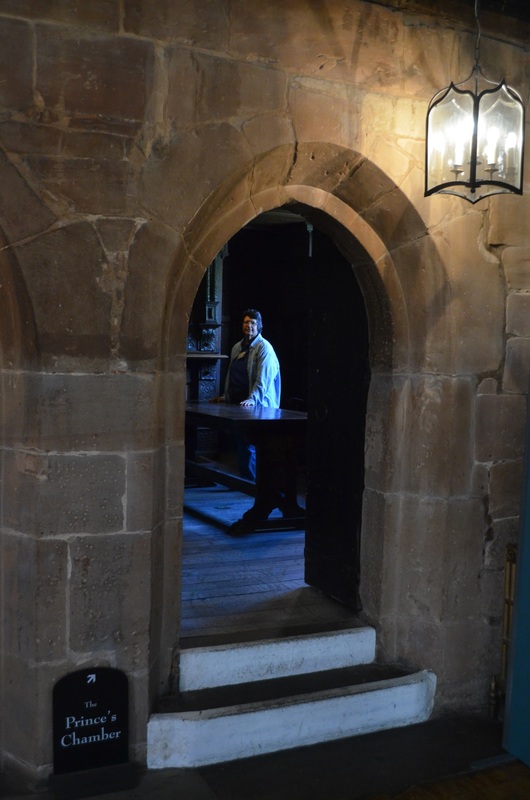 Upon entering the doors from the courtyard today you turn right and climb the stairs, which were open in the original Guild Hall. 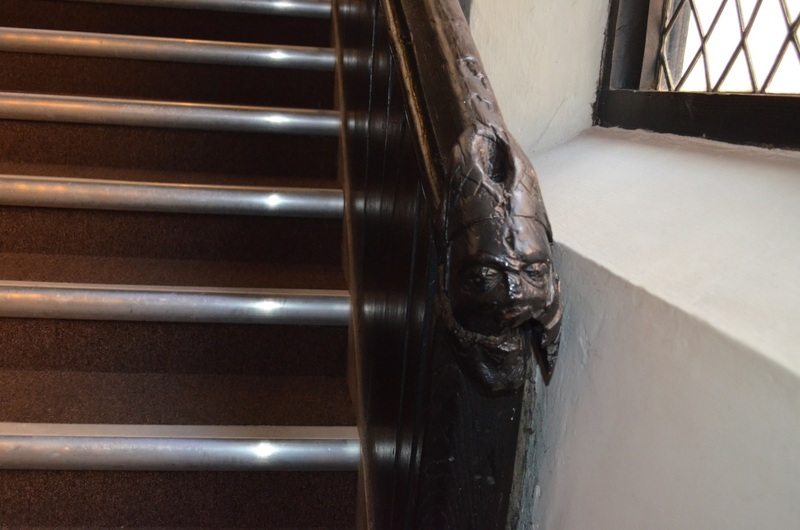 Here’s the original carved railing. 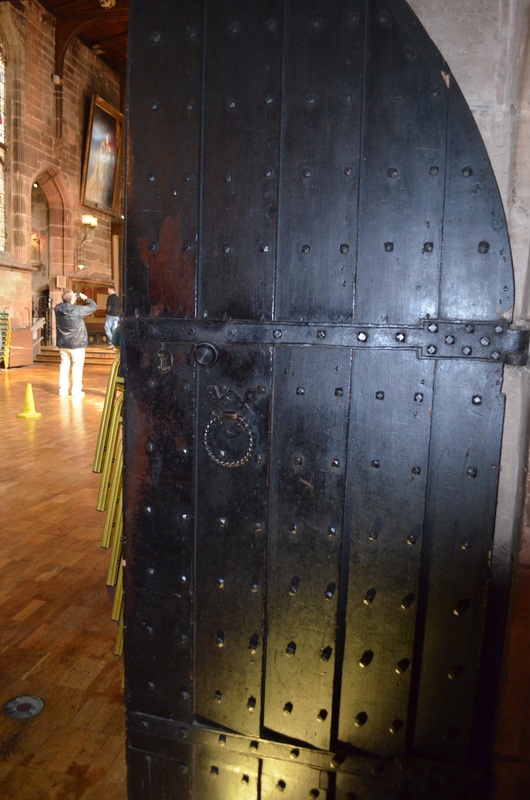 The relative worth of doors, and those who lived behind then, and their ability to stand up to battering from invading “evil forces” was determined by the number of metal studs embedded in the door. Who knew? Never let it be said that I have not visited the Prince’s Chamber:) This is how family legends get started, by the way. “I saw a picture of grandma in the Princes Chamber in England.” In 3 or 4 or 7 or 8 generations, this will be a MUCH better story!!! Behind the glass, under that beautiful stained glass window, hangs a stunning woven tapestry. 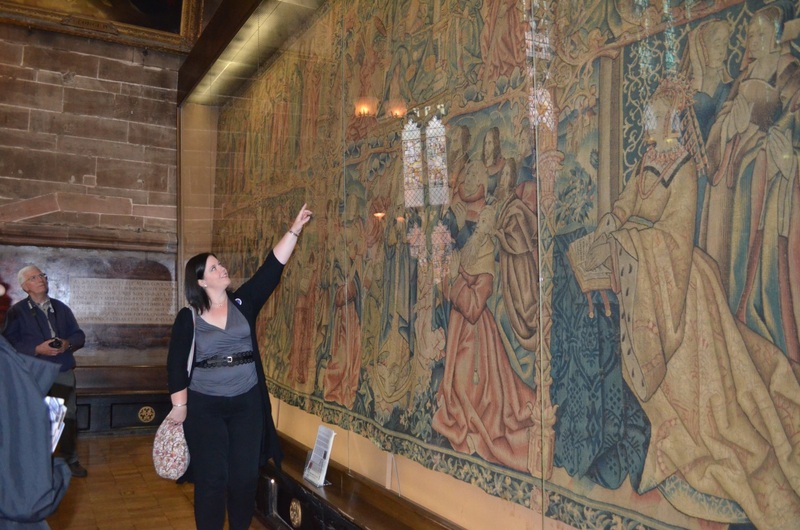 The ‘Coventry Tapestry’ is the highlight of the historic collections at St. Mary’s Guild Hall. Manufactured about 1495 to 1500, its significance lies not just in its age and remarkable state of preservation, but also in the fact that, incredibly, it remains hanging on the very wall for which it was created more than five hundred years ago. 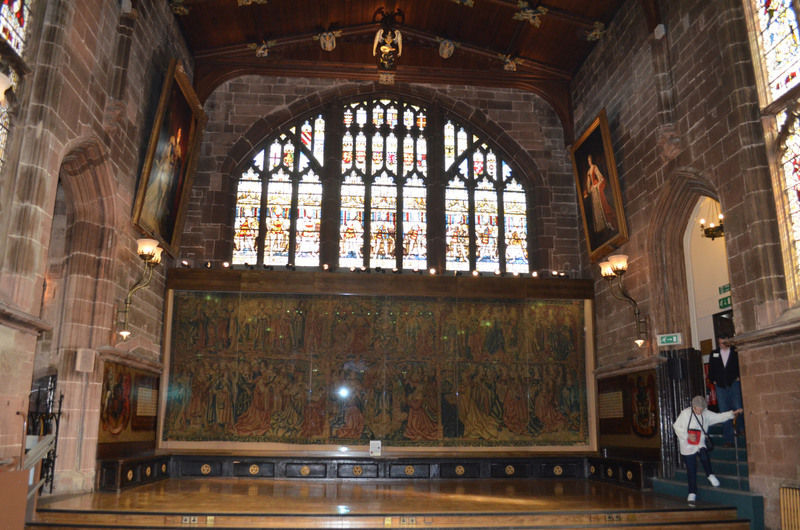 At more than nine metres wide and three metres high, this magnificent artwork dominates the north wall of the Great Hall, and is testament to both the skill of its Flemish weavers, and the wealth of the city of Coventry at the end of the fifteenth century. The scene portrayed includes 75 individual characters, principally members of a Royal court, angels, saints and apostles, with an image of the Virgin Mary at its center, and incorporates numerous examples of symbolism and hidden meaning, some of which remain unexplained. It has even been observed that light from the west windows specifically illuminates the head of the Virgin Mary at certain times of the year, either a strange co-incidence or an inspired feature of the original design. 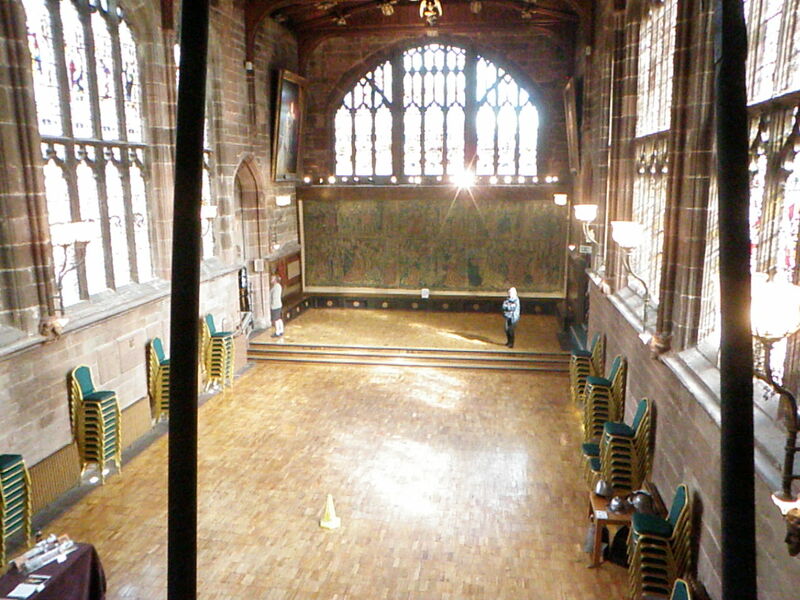 In this photo, you can actually get an idea of the size of the hall itself. It certainly doesn’t look this large from the street. This is the area directly to the rear as you were entering the piazza. 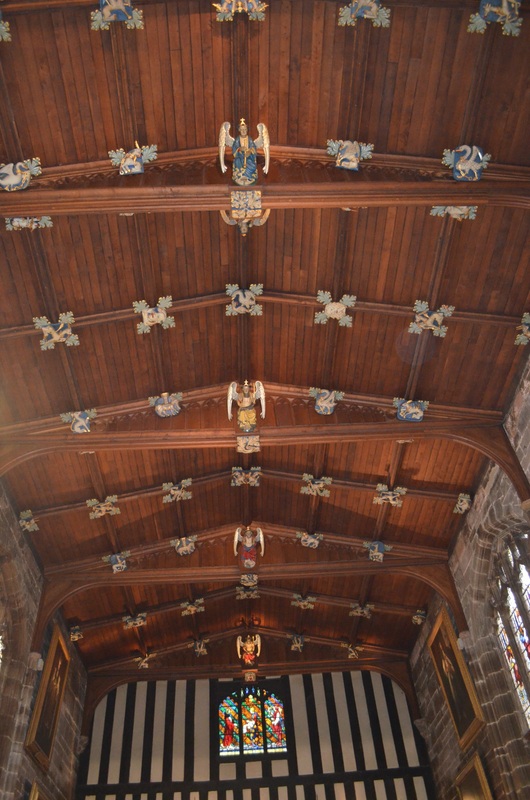 And the Guild Hall ceiling. I just can’t help myself, I love the medieval architecture. 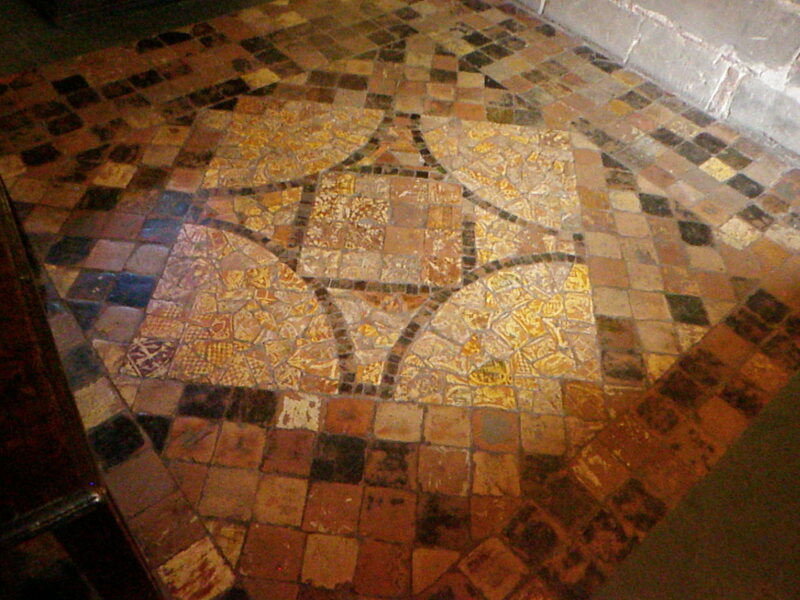 And the beautiful mosaic file floors. 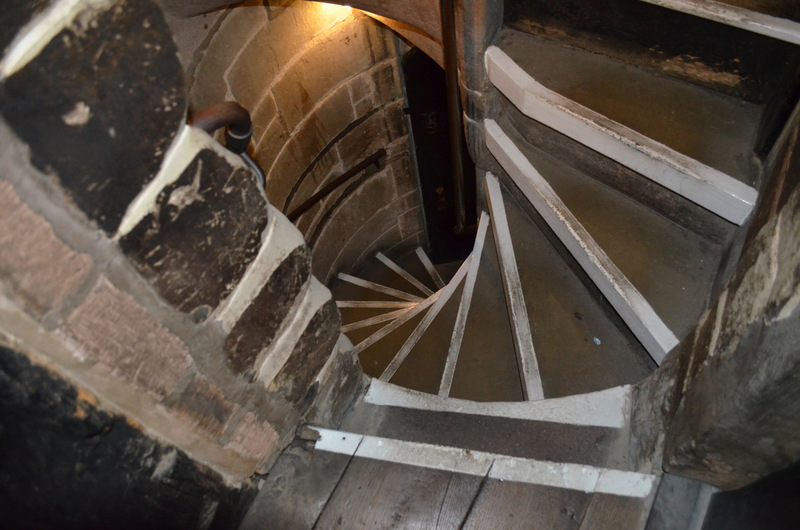 One really interesting piece of history is that there is a small room upstairs, very crooked and sloping, and only accessible via a very small, very steep circular stairway. I’m amazed they let people go up there in terms of safety and liability. Mary Queen of Scots was hidden here at one time. 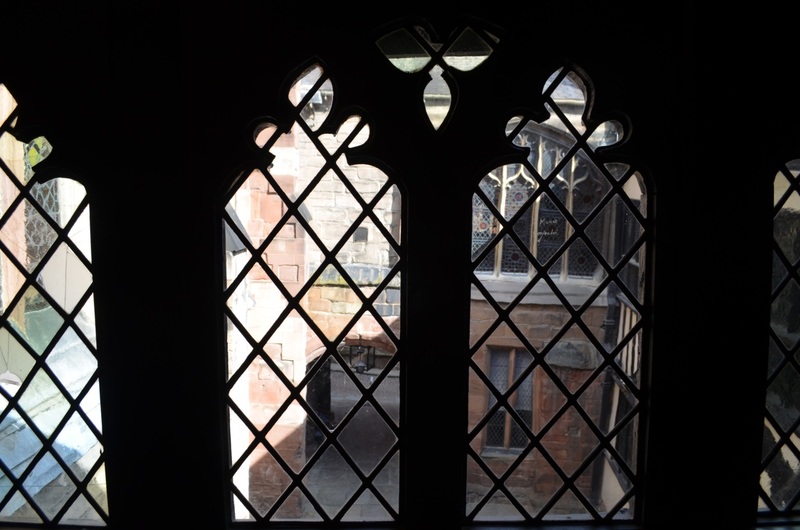 Looking outside into the courtyard and on into the street under the archway though the windows in Mary Queen of Scot’s hidden room. Now you know me by now well enough to know I could not bypass this opportunity. 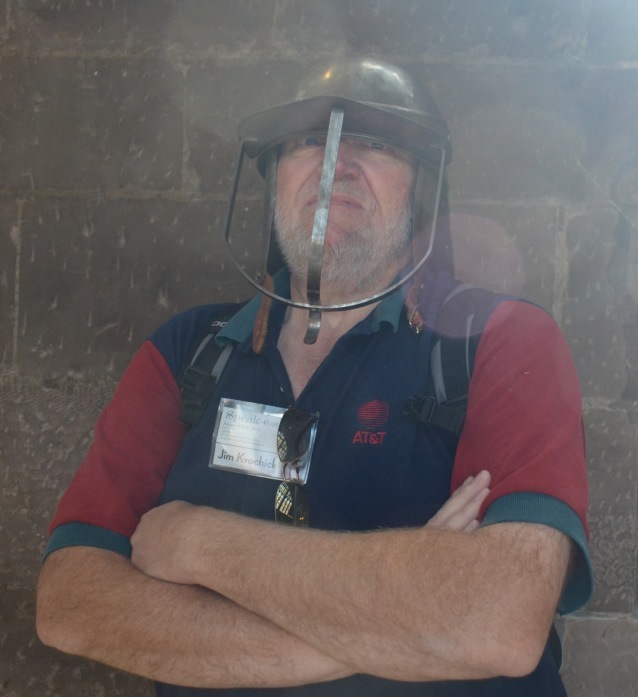 This Viking style helmet was Jim’s favorite. Oh yea, I like this French Troubador one best!!! I think he should use it as his Facebook profile photo, don’t you??? What do you mean, where are the pictures of me in the hats??? There are no pictures of me in the hats:) None. Nada. Not anymore. 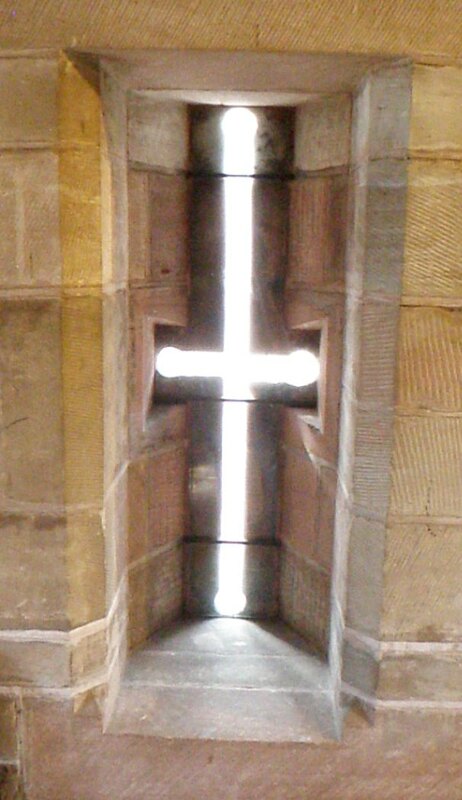 These slot windows were defensive – they were created to shoot arrows through when under siege. 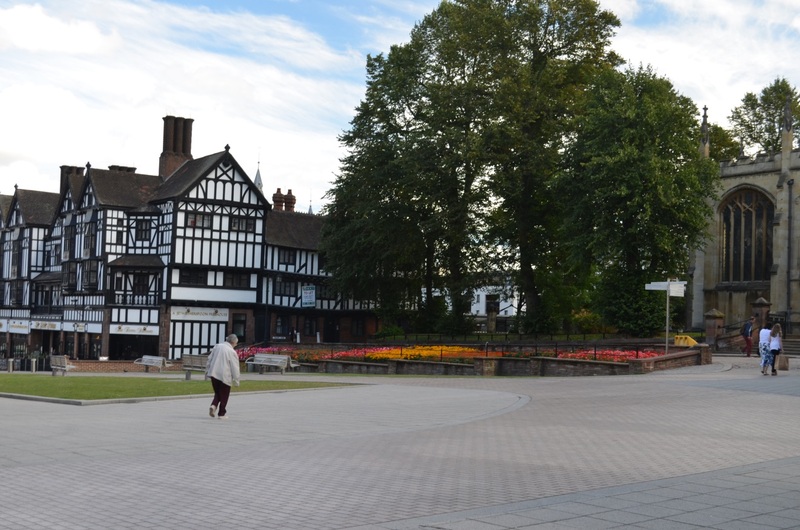 Coventry, like all towns that were once Medieval, has a market space and an open area, usually right in the center of town. Lady Godiva rode here. I wasn’t terribly interested in Lady Godiva, or the statue, but I was extremely interested in the Starbucks on the other side of the square. 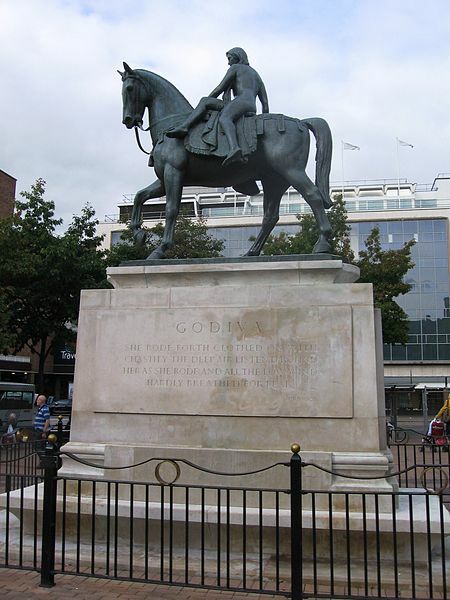 So you’ll excuse the fact that I had to go to Wiki to find a Lady Godiva statue photo:) You know where I was! While I was in Starbucks, I also purchased a salad, because we were running late and I knew that on a Sunday morning trying to find a lunch to eat in half an hour would be impossible. So Jim and I were about to have another impromptu picnic. Starbucks coffee and salad in the sunshine under beautiful blue skies on a Sunday morning in a church, or what is left of one. Truly, what could be better? How can you improve on that? 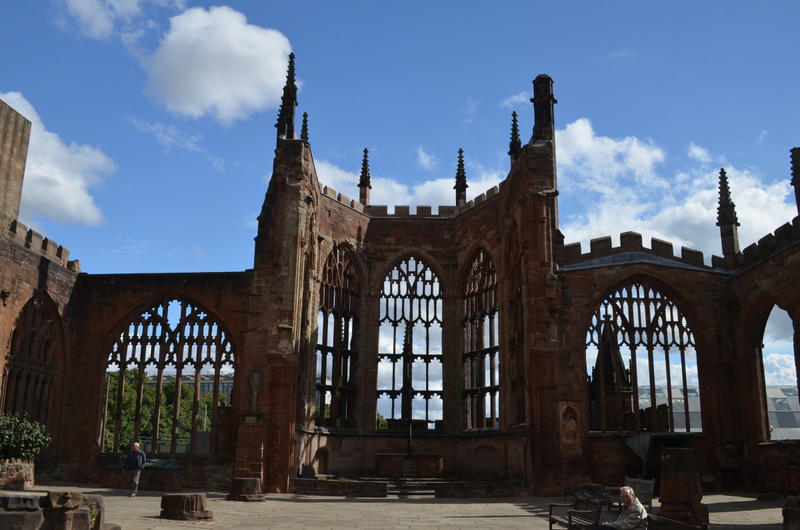 Our next stop was the earliest church in Coventry, now in ruins, because the Germans bombed the city so relentlessly. The bombs burned the church, but the walls still stand. It’s a beautiful skeleton. Our guided tour ended here, and our other family members dispersed to try to find a quick lunch. Jim and I were left to ourselves, or nearly so, in the beautiful sentry standing mute testimony. Once again, we began our picnic. But the church just up the street was letting out and the church bells began to peel. They were beautiful, and the church bells still function, giving voice to this church we thought was silent. 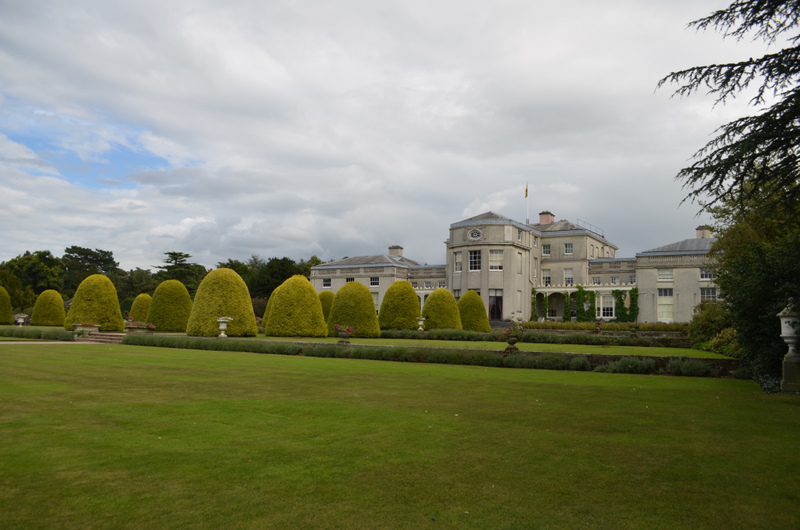 We left Coventry and visited Shugborough Historic Estate. We did a quick tour, because we were running late, again. One of the most interesting things I found was all of the secret doors found in all of the old manor houses. 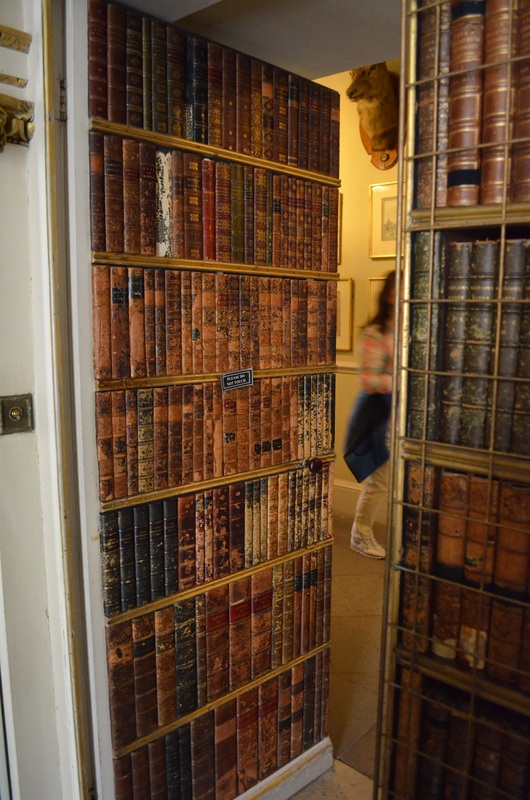 Here’s one example where they took library book ends and made the door look like part of the bookshelves. I found this house to look more “old” than historic. Probably because they had restored it to between the 1920s and the 1970s when it was last lived in. 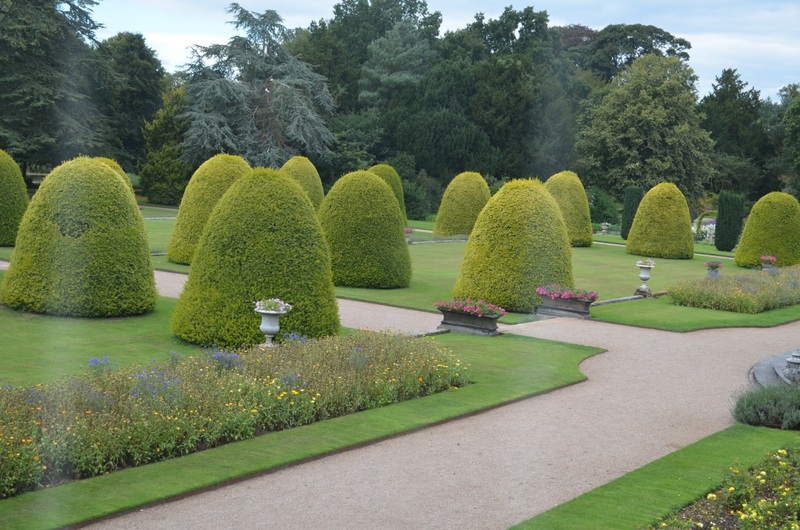 However, from the rear, the formal Victorian gardens were remarkable. The bush shapes remind me of jelly candies:) I’m sure that’s not what they had in mind. From there, we still had about 2 and a half hours to Stirk House, where we are staying in the Ribble Valley. The Ribble Valley is the land of rolling hills and what I would call moors and low mountains; the land of legends as well. It’s believed that the Hobbit books, in particular, Middle Earth, was written after the Ribble Valley. The author spent a great amount of time writing here while his son was in school in the area. It’s a very distinctive area. Outside of London it’s very much like Michigan or the US – but when you enter the Ribble Valley, it’s immediately different, remote, otherworldly. It’s also the land of Robin Hood. 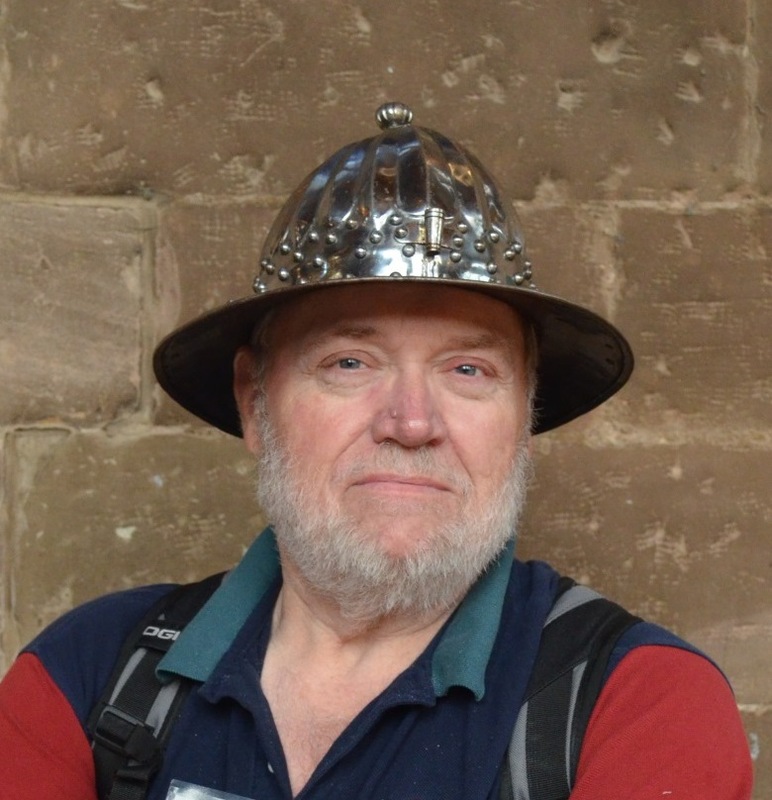 In fact, in the Robin Hood stories, there is a “Guy of Gisburne.” Gisburn is where our Speak ancestors are from. If you remember, this entire trip to the British Isles all began with DNA testing. Our Speak(e)(s) family finally connected with the source location of our American family in the British Isles, thanks to our cousin, Doug, from New Zealand. New Zealand was settled much later than the US and Doug’s family knew where they were from in the UK, exactly, and still had contact with family members there. The Speak(e)(s) family in the US arrived about 1660 and descendants didn’t know where they were from, in England. We had been searching for that information for years. We had suspicions and theories, but no proof. 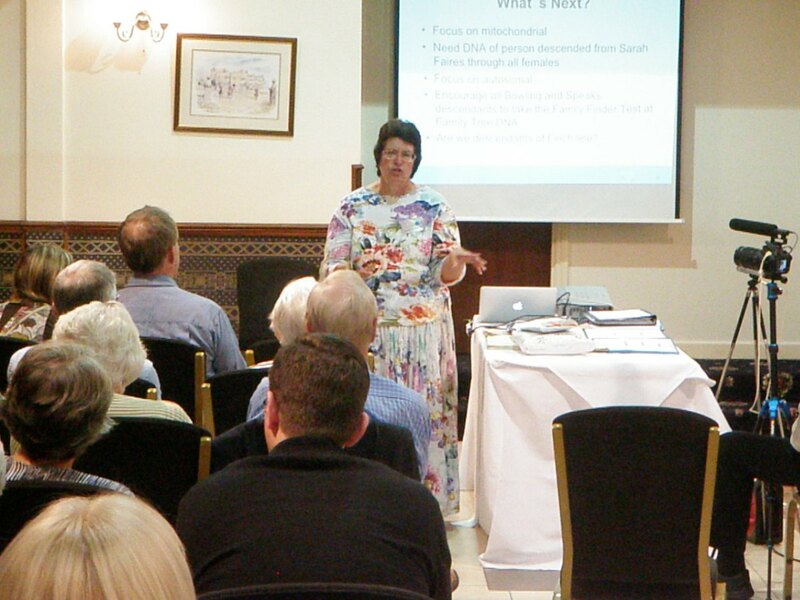 The Speak(e)(s) Family Association meets yearly, and in 2011, I presented the results of the Y DNA testing to our group, ending my surprise presentation with pictures of Gisburn and the throw-away comment of, “I don’t know about you, but I want to go there. I want to stand in that churchyard.” Apparently, I wasn’t the only one, because planning began for the 2013 homecoming in Lancashire, England. The excitement on the bus grew as we traveled. It was palpable. You could feel it. After all, we had all traveled thousands of miles from around the globe to step back in time, not only figuratively, but literally as well in the Ribble Valley. On the way, we were graced with a beautiful rainbow, Getting a picture of the rainbow was a challenge through the bus windows. 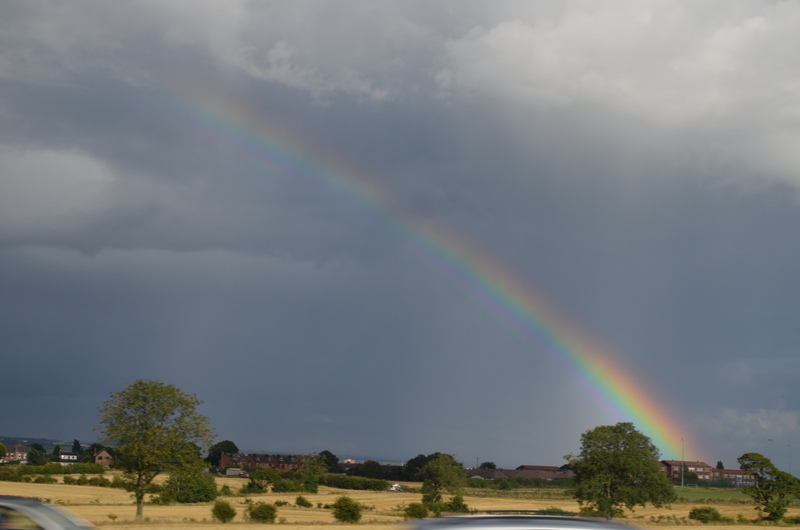 We interpreted this incredible rainbow as a welcome from our ancestors. Turning off the main roads, we began to see signs for places we had researched. The names began to look familiar, Whalley, Gisburn, Clitheroe. We knew we were close. 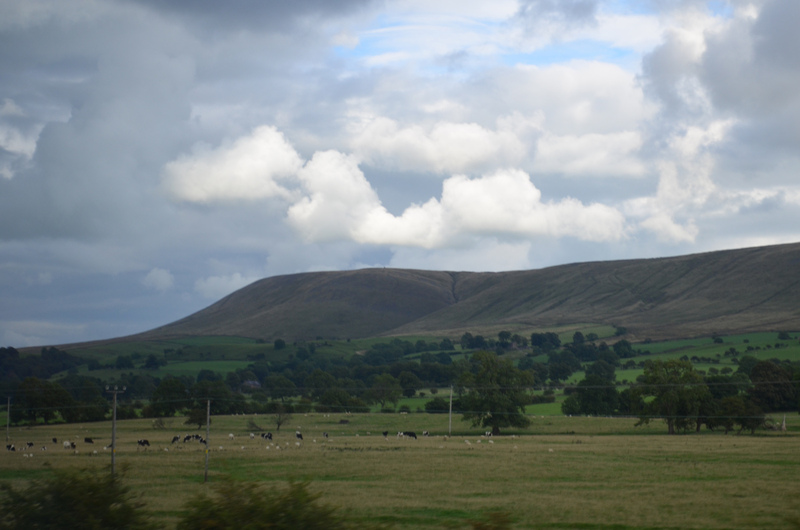 This photo is of Pendle Hill, a local landmark that you can see from anyplace in the Ribble Valley. To the right is the east end of Longridge Fell. Mist lies in the Ribble valley between them. This panoramic view of Pendle Hill is not from the Ribble Valley, but from Newchurch on the other side of the hill. Here is our first view of the Ribble Valley. These hills are high enough that they are moors on the hill. 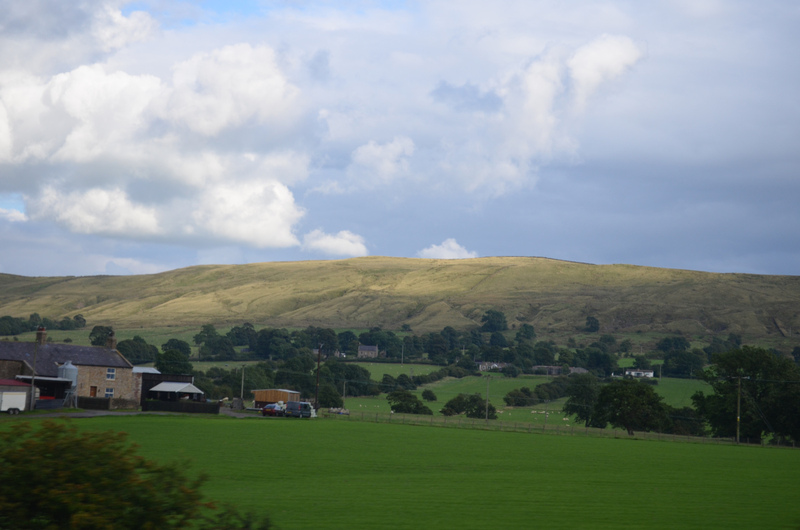 Pendle Hill towers over the entire Ribble Valley, along with a ridge and cliffs. Below was our first view of Pendle Hill. The Pendle Hills are full of legends, and sheep. One of the legends is of the Pendle Witches. England did not escape the witchcraft craze and several women were executed here in the Pendle area for witchcraft in 1612. One test of being a witch was to be held underwater for 30 minutes. If you were dead, you were innocent. If you were alive, you were then tortured and killed for being a witch. Talk about being dead right. 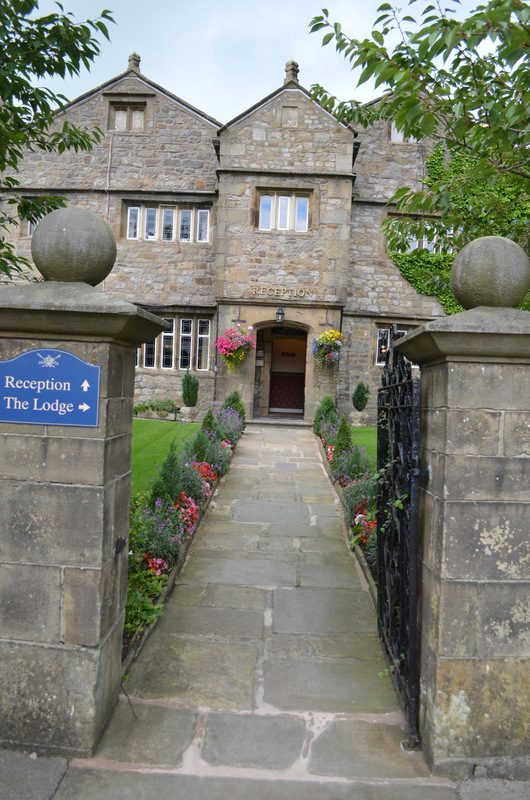 One of the issues we had with the travel agent was where to stay in the Ribble Valley. There aren’t any Holiday Inns. In fact, the agent wanted the bus driver to take us back each evening to Manchester, 40 miles distant to a sterile Best Western. 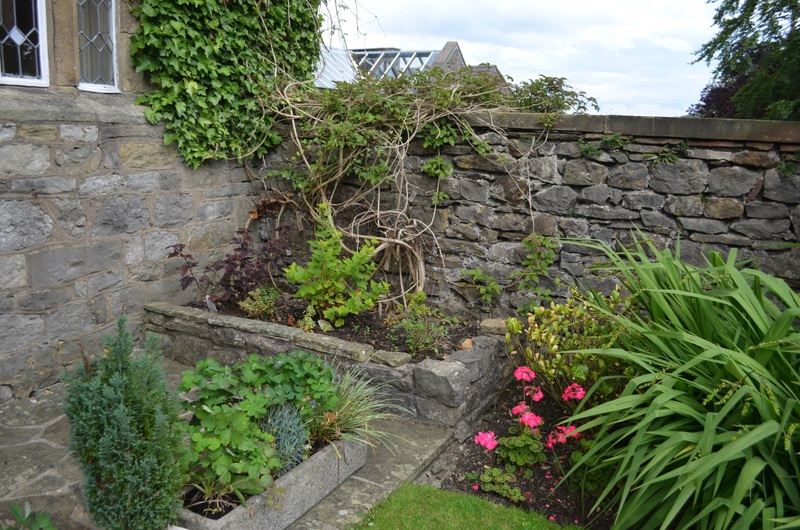 We wanted to stay in the Ribble Valley, to be where our ancestors had been. Susan found a conference/meeting facility, literally, in the middle of the valley, that was a restored manor house. We wanted to stay there, but the travel agent didn’t have a “working relationship” with the Stirk House. The day came when we simply told them to figure it out or we would, without them, because we were staying at the Stirk House. 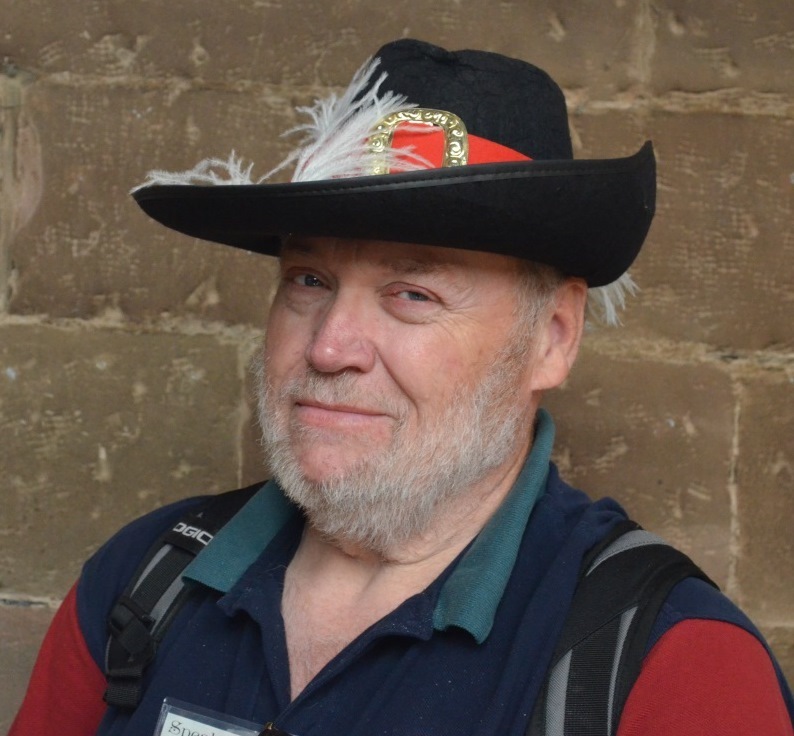 Our cousin, Steve Speak, could not join us in the Ribble Valley, but he did meet us in Cambridge for dinner. Steve is from the Gisburn area and told us that the Stirk House was purchased in the 1930s or 40s by a Peter Speak and he took the next 20 years to restore the manor house which had deteriorated into a terrible state. On the way, in the bus, Susan took a look at the Gisburn Church records, and sure enough, a Speak woman died in the 1940s, is buried in Gisburn at the church and her residence was listed as “Stirkhouse, Gisburne.” Now how uncanny is that. So regardless of exactly where in this beautiful valley our original Speak ancestor lived, we are indeed staying on historic Speak land at the Stirk House. The Stirk House was everything we could have imagined and more. Beautiful facility, wonderful gardens and nature area, good food and a spa if you’re interested. I love the moss and ferns growing on the rock walls. We had planned this event with the intention of meeting any Speak family members who might remain in the area, whether they carried the Speak surname or not. We ran ads in regional genealogy/historical publications as well as in the local newspaper. We also had an English contact which we thought might have made local people more comfortable. Several Speak family members joined us for dinner. The Stirk House had a private dining room for us, beside a meeting room. 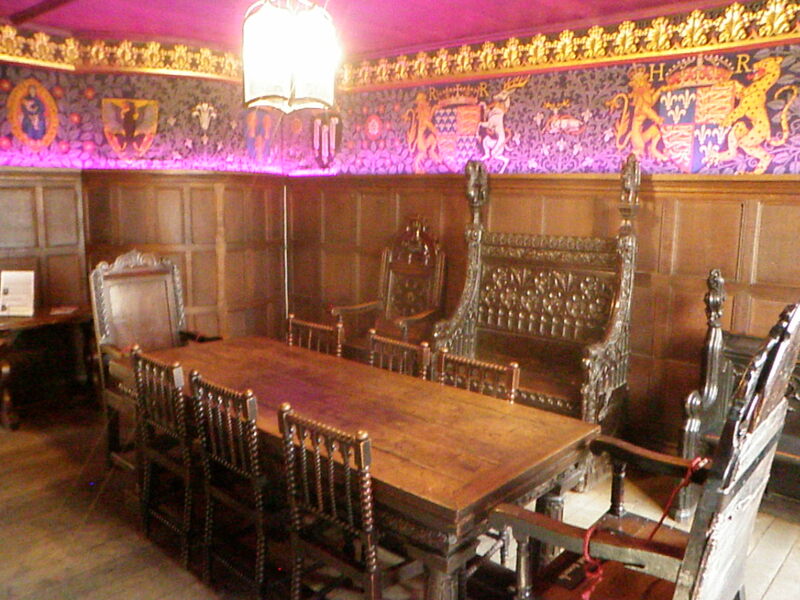 We had dinner together in the dining room here, an English country dinner, and then moved on to the evening’s agenda. 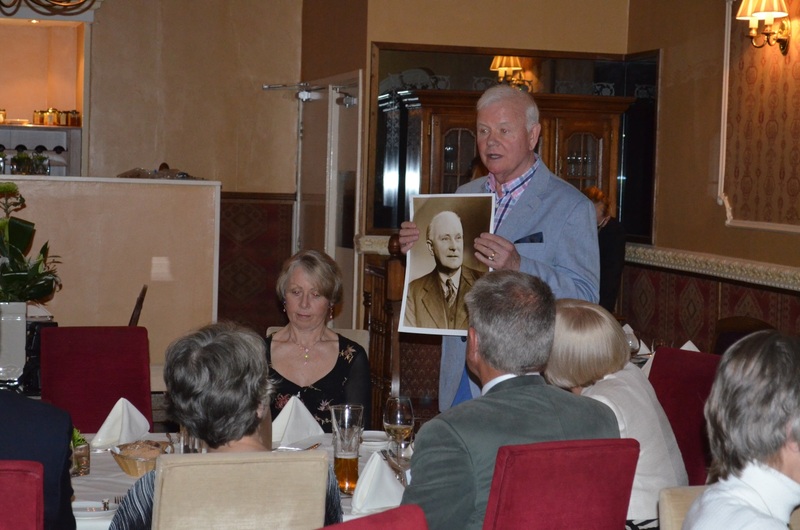 Some of our Speaks relatives joined us for the evening. It was nice to meet some of our cousins, no matter how distant. Three different male Speaks brought their families, David, Stan and Gary. David brought photos of his family and shared information about his family history and the area. And yes, all three did a DNA test. They felt certain that they were not related to each other. We are probably at least 15 generations removed, but still, we are indeed cousins. It’s interesting that even after all of these generations two of our English cousins do share segments of DNA with some of us. Not all of the results are back. Now that I think of it, we’re probably related to all of the Pendle witches too. That makes sense, because they were convicted of talking to cats and dogs and one was convicted because her children testified that she was a witch. Heavens, that could have been me:) I need a Pendle Witches t-shirt! We moved to the meeting room and two local people gave historic presentations about the area, which were really quite interesting. We ended the evening, finally, at 11:45 PM following a DNA presentation and update as to how our DNA brought us to the Ribble Valley. This entry was posted in Autosomal, Success Stories, Y DNA and tagged 2013 DNA Trip by Roberta Estes. Bookmark the permalink. Lucy B. Speaks, daughter of George W. and Martha Mathews Speaks was the wife of my great grandfather, Rev. Vines Turner of Lunenburg County Virginia. They, and their huge famiy migrated to Ripley, Lauderdale, Tennessee. I believe that is where she died. Small world. I wonder if this is the same Speaks line. If this genealogy line at Ancestry is correct, then we both descend from Thomas Speak the immigrant and Elizabeth Bowling. http://trees.ancestry.com/tree/39737810/person/19573696951?ssrc=&ml_rpos=3 Will you please join the Speak project at Family Tree DNA so that I can see if your autosomal DNA matches that of any of our participants? Click on Project on the top main menu bar, then join, then type Speak into the search box, then follow the links and click join. This is exciting!!! My 1967 Triumph Herald was made in Coventry. The factory is a museum now, perhaps you could pick up some parts for me ? I need a new frame…. 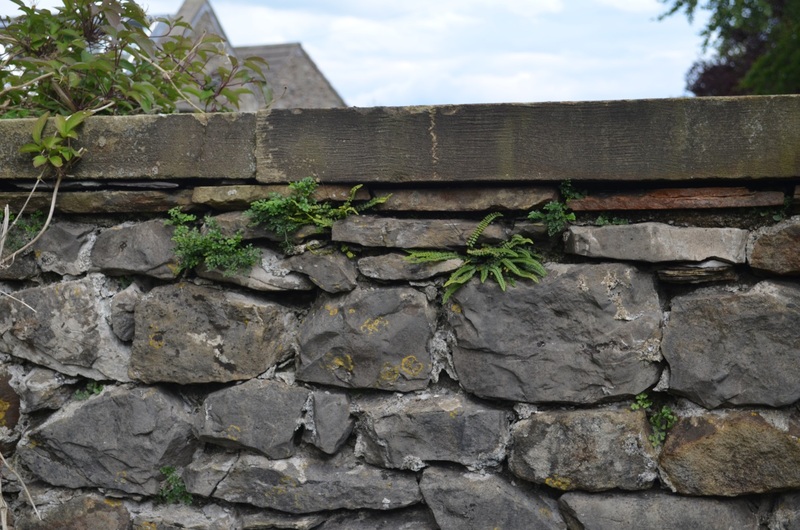 I loved this visit to Ribble Valley, the adventures, and the beautiful photographs. My Turners were basketweavers from the Derbyshire area. 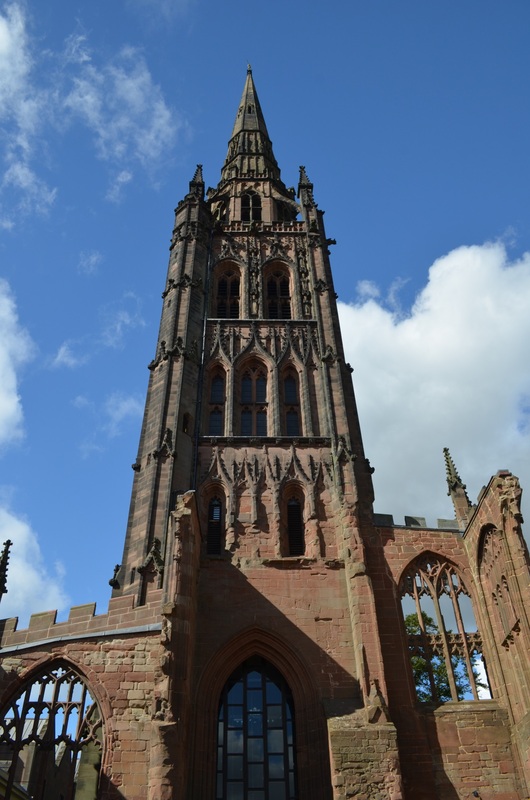 Coventry was a truly beautiful and historic city. Unfortunately, we only had half a day on a Sunday. I have fallen in love with the British Isles! I think there is also a marble status of her in the guild hall. Do you know if there were any actual contemporary drawings of her? I love what you did with your Lancashire DNA on your blog, tracking the story from Africa. Our DNA is so full of history. Outstanding email!!! Wish I could go there!